Plan on a very early start or do what i do... Start it at 1 PM and get everything smoked and into the Crockpot. Then let it slow cook over night. This way it will be all done when you wake up in the morning. 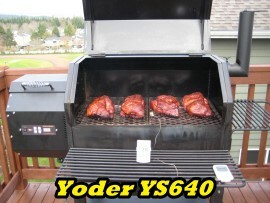 Fire up your smoker and get it pre-heating to 170 degrees. In this cook I used BBQr's Delight Pecan and Cherry pellets mixed 50/50. 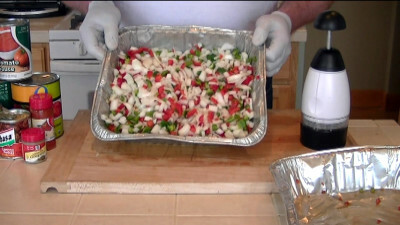 Coarsely chop 2 large sweet onions and place them in an a aluminum pan. You will put all the chopped veggies in this pan to smoke. Coarsely chop both bell peppers. Finely chop 8 cloves of garlic. All this goes into a aluminum pan. Next pour a 28 oz. can of whole peeled tomatoes into a second aluminum pan. Using your hands, squeeze and crush the tomatoes. Add the 28 oz. can of diced tomatoes, 15 oz. can of tomato sauce and the 6 oz. can of tomato paste. 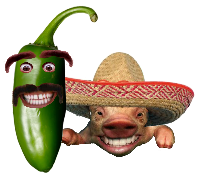 Open the can of Chipotle pepper. Remove any stems and slice the peppers. Add them to the tomatoes in the aluminum pan. Poke many holes in the bottom of a 3rd aluminum pan. This will allow the fat to drain away from the meat when smoking. 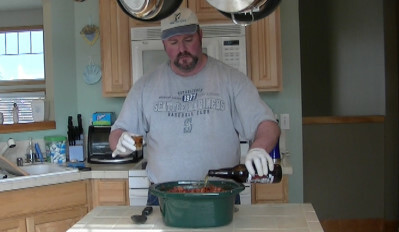 In this aluminum pan, mix 3 tbsp of Rich's Mad Hunky Meat Rub (or rub of choice) with 1 lbs. ground hamburger and 1/2 tsp coarse ground black pepper. Spread the ground beef evenly across the bottom of the pan. Trim the fat off 4 lbs. of thick cut top round steaks. I chose two steaks cut for London Broil. 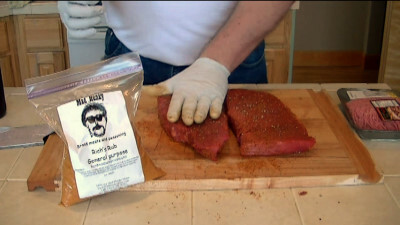 Shake on some Rich's Mad Hunky Meat Rub and rub it into the meat. Shake on a little coarse ground black pepper to taste. 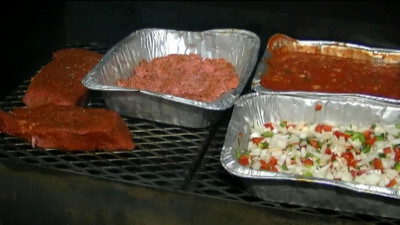 Place the two steaks and all three aluminum pans containing the veggies, tomatoes and ground beef into the smoker. Smoke at low temp (170 degrees) for two hours stirring every 1/2 hour. You want the smoke to get into the food but you don't want to cook the moisture out of the veggies. 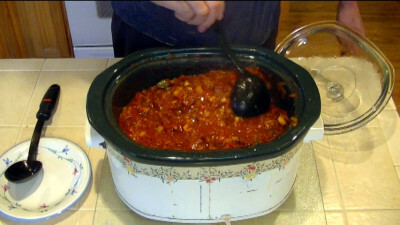 We want the moisture to escape into the Crockpot later. After 2 hours the ground beef should be browned. If not leave it in a bit. Increase the smoker temp to 225 degrees. 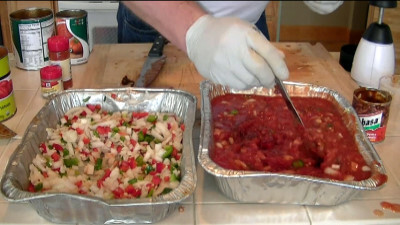 Remove the aluminum pan containing the onions, peppers and garlic. Pour the contents of this pan and the browned ground beef into the Crockpot. Add 2 tsp Oregano, 2 tsp Cumin, 1 tsp Paprika, 6 tbsp chili powder and 1 tsp coarse ground black pepper. Stir the spices into the smoked onions and peppers. 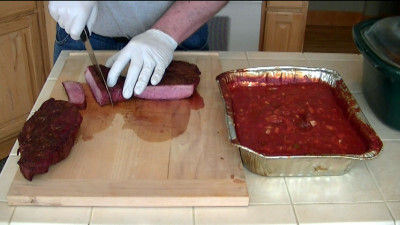 Continue smoking the steak and tomatoes until the center of the steak reaches 145 degrees. 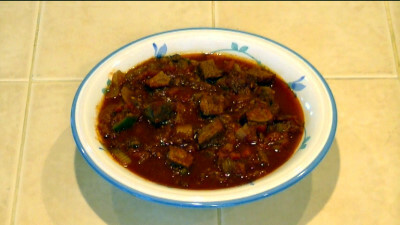 We want the steak to be full of juices as it will add flavor to the chili slow cooking in Crockpot. The steak should be pink in the middle. Once the steaks are at temp, remove them and the tomatoes. Cut the steaks up into small medium and larger cubes to your liking. Pour the cubed steak and all the juices you can salvage into the Crockpot. now pour in the tomatoes. Add 1/4 cup of brown sugar. You won't see this in the video as I accidently left it out of the video. 6 hours later your house will be filled with the wonderful smell of my Rogue Texas Chili. Steal a bite... It's OK for the cook! After the Chili has been slow cooking for 10 to 12 hours it's time to break out the chili bowls and crackers.